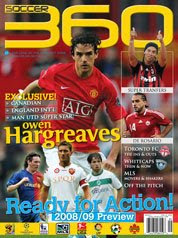 It's not often that the Canadian soccer set can boast about some Canadian content on the world stage so it's a treat to see Calgary's Owen Hargreaves gracing the cover of Canuck footie magazine, Soccer 360. Regular readers of my site know that we're an Owen Hargreaves friendly blog -- we don't have time for those misguided know-it-alls who like to have a go about Owen leaving Canada to play elsewhere. Any intelligent person realizes, you go where there's opportunity to prosper. It's fitting that this Canadian publication addresses some of that banter in their interview with the Manchester United mid-fielder. Owen's life in Canada before he packed up and moved to Germany as a teen to join Bayern Munich's roster is not that well documented. For us fans, it's great to see the Calgary connection explored a little further -- granted a little *more* depth would have been even better! Ah, at least it's a start!